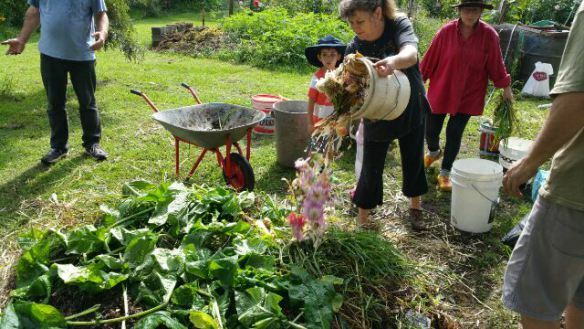 Here is an update from the Permaculture Southern Highlands Seed Network for those who are interested. 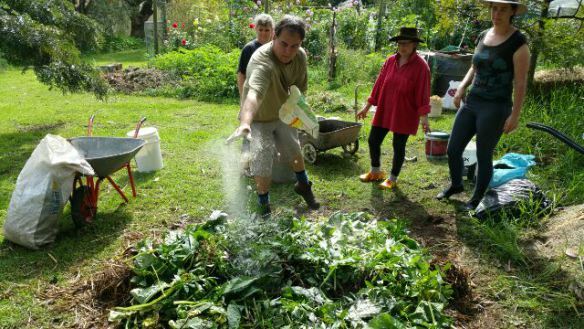 I have also uploaded their newsletter and an extract from their database of what to plant when in the Southern Highlands. Bio-dymanic Composting at Paul’s home. 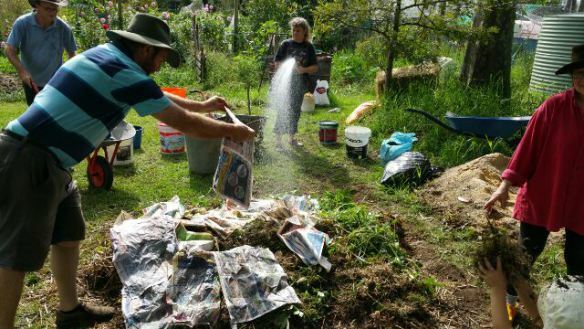 Our April meeting was at Paul’s home and along with the usual swapping of produce, chatting and catching up, we got down and dirty doing some bio-dynamic composting. There are lots of sites out there that go into detail about it so we won’t, but here is what we got up to and why we did what we did. 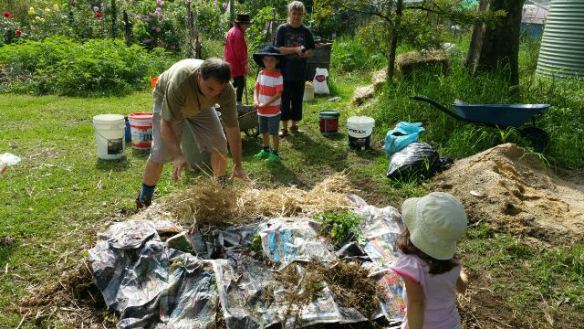 In short, bio-dynamic composting is the art of creating a compost heap with all the correct nutrients (macro, micro and mineral) to allow it to decompose without turning or further external inputs. The creation of this kind of heap requires you to have all the materials available in one go. 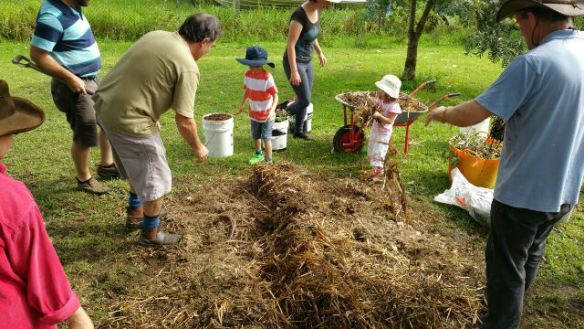 It is not the kind of thing you can build gradually and it takes around 6 months to compost enough to then use. Thank you so much Sahrn from Greener Me for taking all the photos. 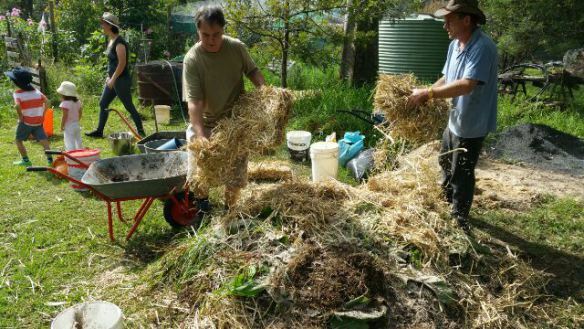 Step 1 – Suitable aeration: Like with all things natural, it is necessary to ensure that the area chosen for the bio-dynamic compost heap has plenty of airflow. This ensures that any organisms which are breaking down the heap can breath and the gases they produce can escape. To ensure this, we created a row of sticks in the shape of an inverted V. This creates a tunnel for air to flow through under the heap. Step 2 – Lots of brown matter: Once the air flow tunnel is in place, we layered lots and lots of brown, dead matter to create the base layer. 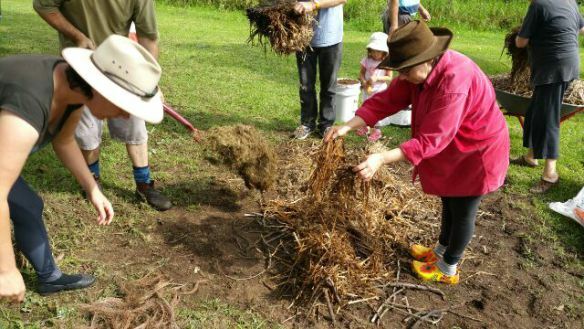 Things like straw, half rotted compost, mulch, tree bark, etc are perfect. The kids loved helping with this and started to get nice an dirty! 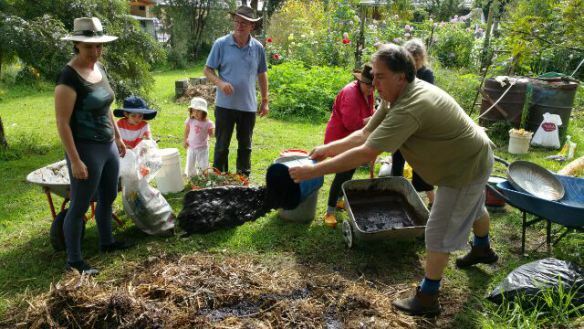 Step 3 – Manure sludge: To kick off our microbe colonisation with a bang, we then added at least a wheel barrow full of cow manure sludge to the brown layer. The sludge was essentially made by filling a wheel barrow with cow manure, breaking it up and then filling it with water. It was left for a day to ensure that it was nice and runny. On goes the bucket Paul! Step 4 – Lots of green matter and a touch of lime: Once the sludge has been added, we then piled on a good layer of green matter. 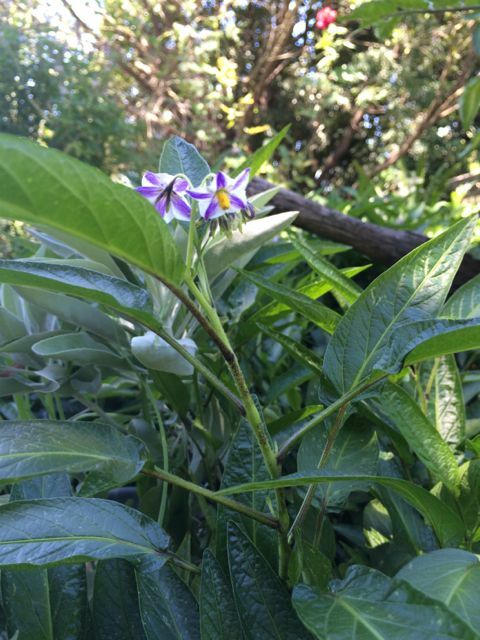 There was comfrey, lots of kikuyu runners, bits of vegetation, etc. As long as it had recently been photosynthesising, it was added! 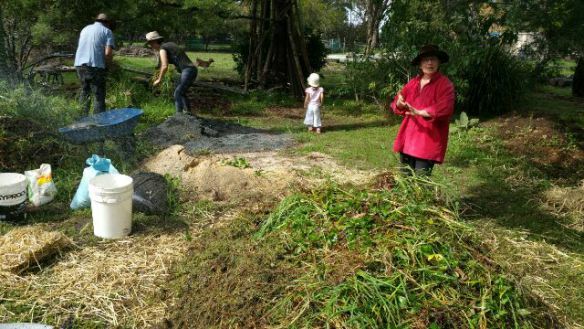 On top of the green layer, a sprinkling of lime was added to aid in balancing the overall pH of the composting process. 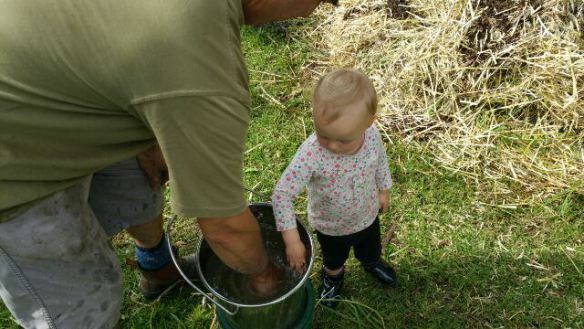 Step 5 – Water it all in well: Nothing is more important than ensuring that the heap is well watered at every stage. If not, the entire process can stall as the microbes and organisms in the pile won’t be able to colonise the dry matter. Step 6 – repeat steps 2-5 until you run of out material: Essentially, keep adding alternating layers of brown, sludge and green matter. Remembering to water it as you go. Keep doing this until you run out of stuff to add (or you get tired and need a break). We didn’t take note of how many layers we did … but the pile was over a meter high and at least 2m x 2m at the base when we were finished with it. Step 7 – Adding the bio-dynamic components: Paul had purchased a bio-dynamic kit and we inserted all the essential oils, powders and other components as directed on the packaging. The rest of the day was spent exploring. 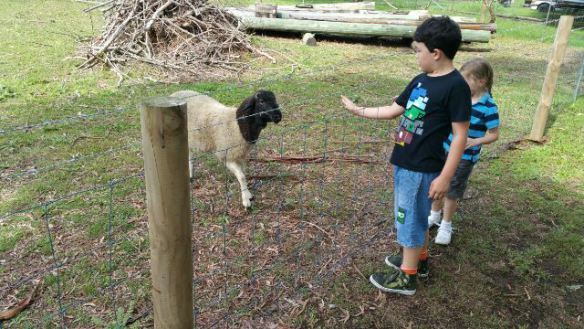 The kids fell in love with the neighbours sheep and goats along with Malle and David’s dog. 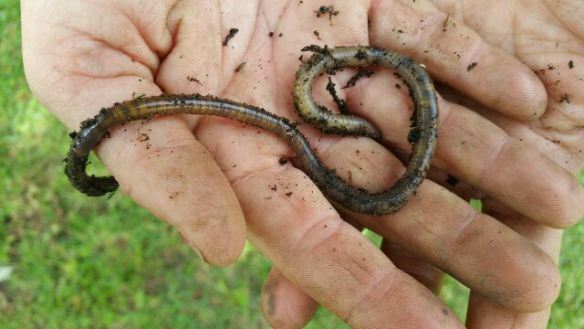 Worms were examined and touched by little fingers and then we all sat down for a well deserved lunch. We also agreed on what to do over the next few weeks! Bonus. 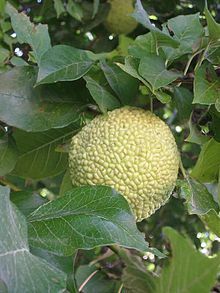 They are also called hedge apple, horse apple, monkey ball, bois d’arc, bodark, or bodock. 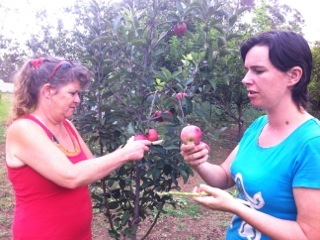 One of the team from the Elizabeth Macarthur Agricultural Institute, Terry Osborne, would like to get some fruit off them to see if they contain Queensland Fruit Fly. Please email him if you have any fruit or know of a tree in the district with fruit on it. 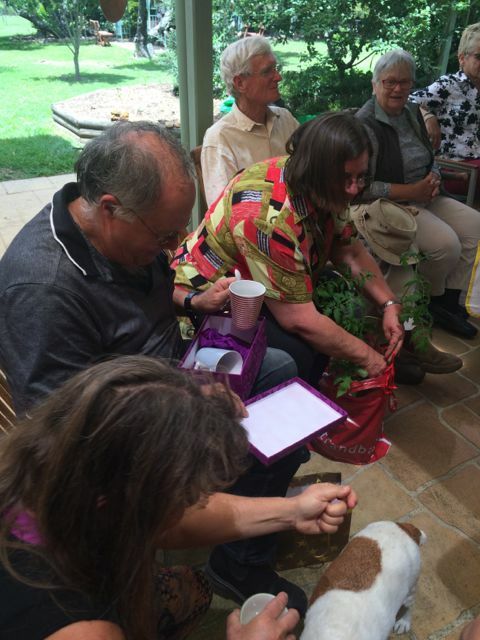 Our March meeting was held at Janine and Steve’s home with a Harvest Festival theme. 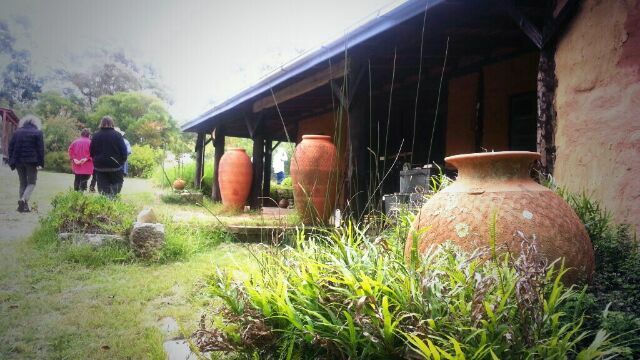 They are very talented potters and have a wonderful approach to life. A wander in the garden was, as always, a blissful experience. 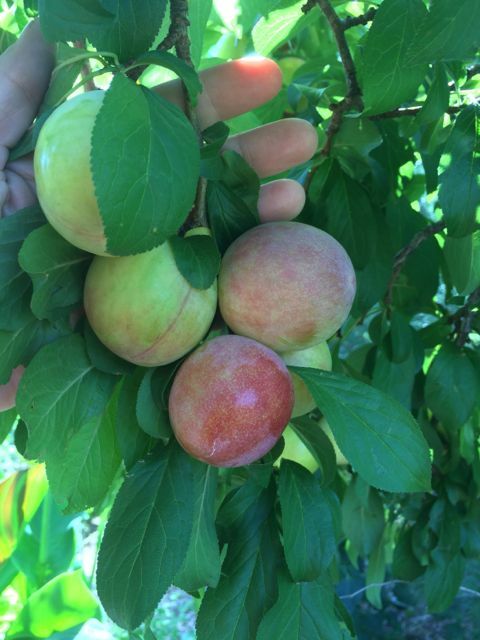 With plenty of vegetables in abundance and lots of fruit coming into harvest soon. 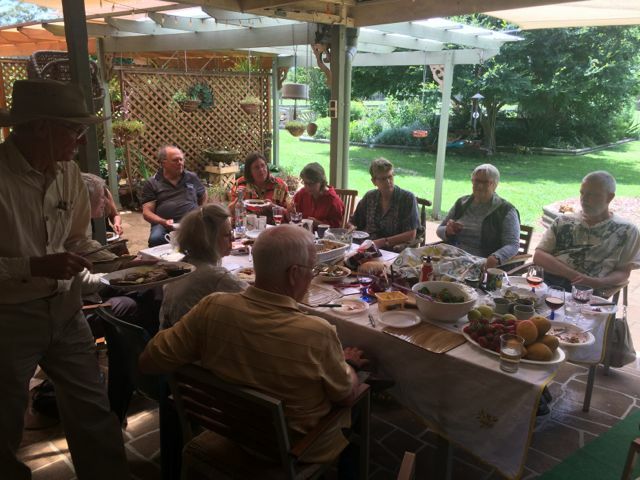 We had a great turnout with lunch being held under the romantic grape vines with some of the Elderflower wine from the last meeting. 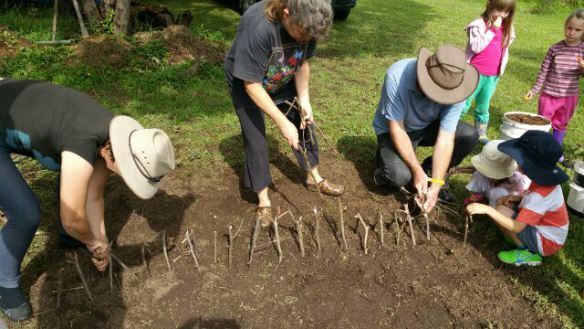 Janine and Steve shared their home made cider and freshly made grape juice and Malle brought some humungous Williams Pears to share – very impressive. Our fermenting day turned out to be quite fruitful. 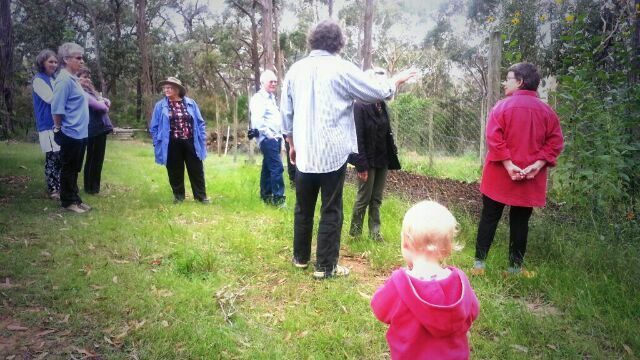 We met up at Fiona’s home in Rossmore and roamed around her garden, young orchard and checked out all things chicken. 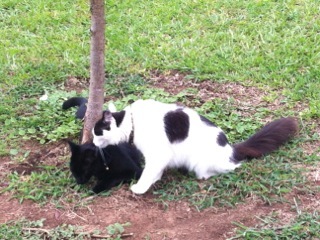 The kids and cats tagged along quite closely. 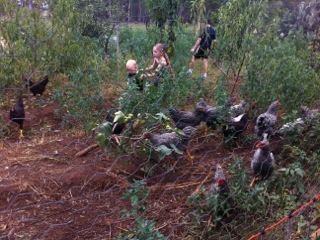 Children chasing the chooks in the chook pen. 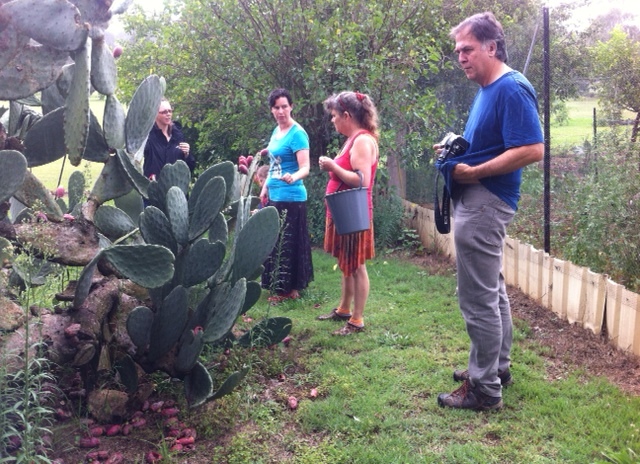 Checking out the prickly pear. We then set about juicing apples ready for cider. Lunch was delicious with plenty of food thanks to everyone bringing something special along. It was followed up by bottling already brewed cider which Fiona had made earlier. 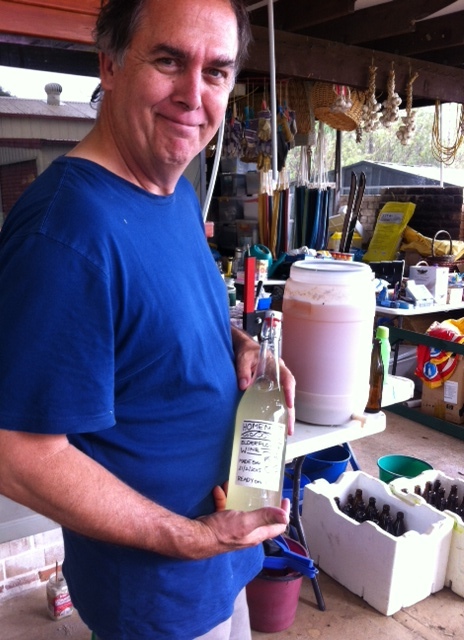 Then we bottled off the Elderflower wine brought along by Paul. Fiona quickly drew up some labels for all the bottles too. Washing and juicing the apples and pouring the juice off for cider. 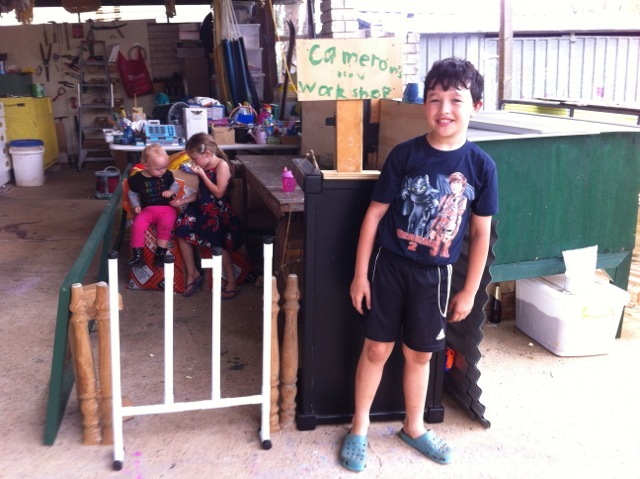 The children enjoyed the day too, creating a little nook for themselves, complete with fence to keep the adults out and seats made from bags of chicken feed … imagination is a wonderful thing! Today was a relaxing gathering which turned out to be as much about food as it was about seeds. We essentially nibbled our way through from morning tea to mid afternoon. Our nibbles included home made scrumptious rice paper rolls (recipe definitely needed for this one Sarhn) with a bean and herb filling; Summer salad with carrot, beetroot and mint; fresh grape tomatoes and basil parmesan pesto with crackers; freshly made guacamole; a lush green salad picked from the garden that morning and two delicious gluten free cakes. One was an orange cake and the other was an almond cake. 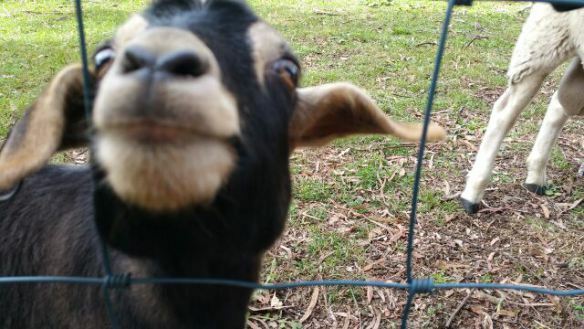 Needless to say, we comfortably chatted while grazing! 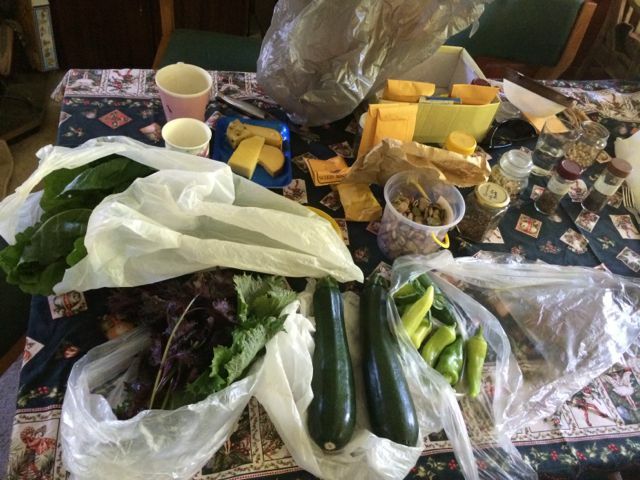 When it came around to sharing our produce, Janine brought out an esky load of fresh produce. Filled with zucchini, chard (spinach), little sweet banana capsicums, rhubarb, lettuce, Chinese greens (sorry forgot their name Janine) … there was sooooo much! Thanks Janine! 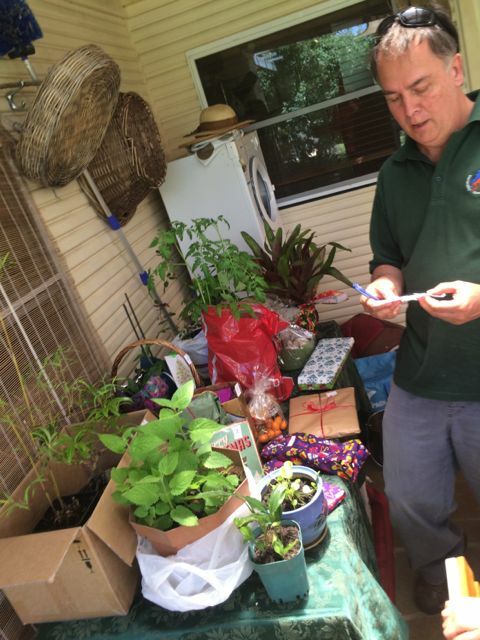 Paul brought along a bounty of seedlings to share as well as seeds. Capsicums and tomatoes being the main theme here. There were at least 3 trays of seedlings to choose from. It was excellent. 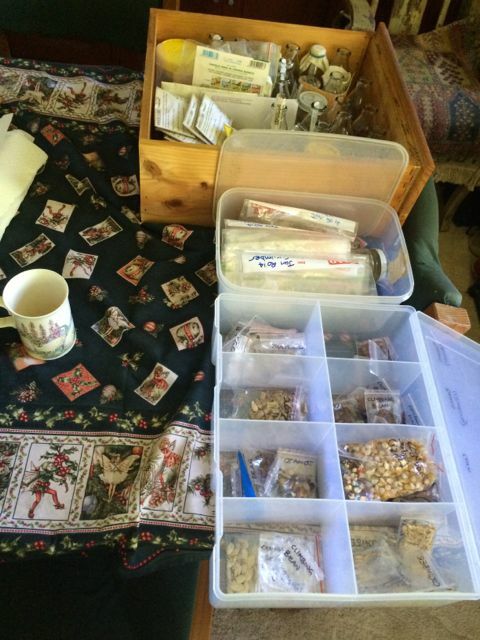 Fiona brought along one of her seed drawers, with different corns and beans being the main focus. She also brought along some of her garlic braids which she has been selling through her farm store. They were impressive indeed. One of the braids held 24 very large garlic bulbs. Sahrn brought along a huge bag of coffee grinds to share around. Coffee grinds are an excellent addition to any compost due to their high carbon content and their ability to be used by microbes as a host. 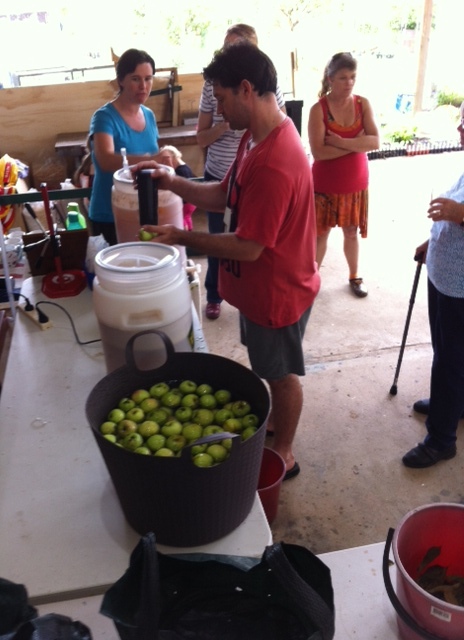 Paul later showed everyone how to collect tomato seeds by fermenting them. He brought in a jar of seeds that had been fermenting for a few days and showed how easy it is to wash the seeds and dry them. 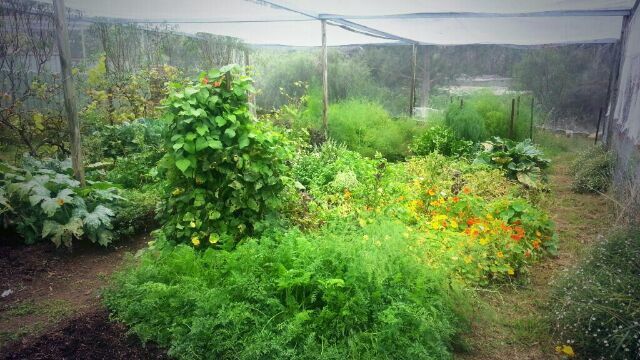 Anne then showed us through her garden and we all raided her pepino and her lemon scented verbena. Here are a few photos from the day …. Some of the veggies from Janine’s garden. Those that were not immediately whisked away that is! There are also some of Paul’s seeds too. Fiona stores all her seeds in a tallboy (and yes its full). This time she brought her beans and corn collection along with some veggies that were good to plant now ready for winter. 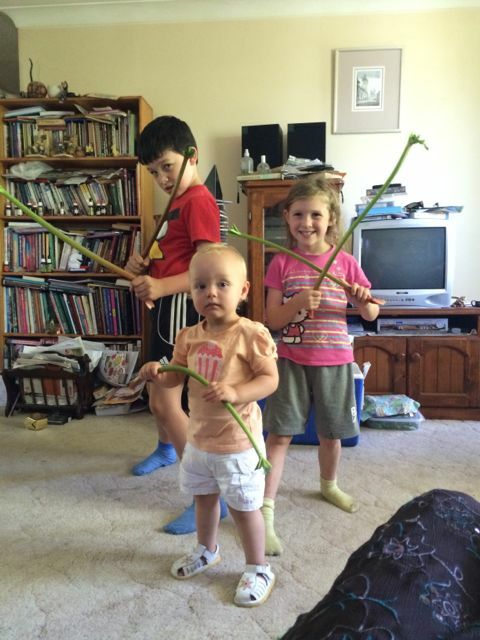 The children discovered that rhubarb makes an excellent substitute sword. They hadn’t seen rhubarb before and had called it “massive celery sticks” … quite observant actually. 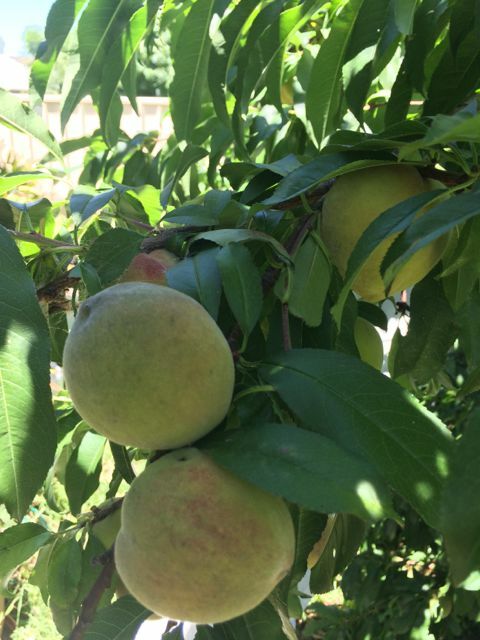 Anne’s white peaches are maturing nicely. Some are in large exclusion bags to stop fruit fly attack. These “little” guys were nearly the size of tennis balls! 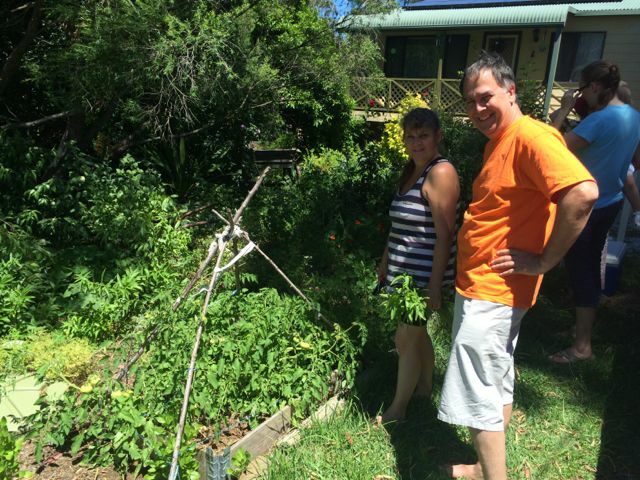 We surprised Paul and Anne with a photo of them discussing the tomato trellis. Anne has managed to grow a huge pepito plant. 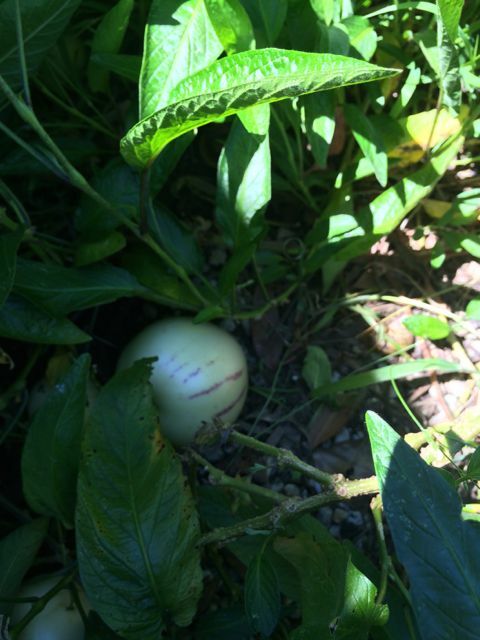 It was so large, we all thought it was a weed that had taken over her front garden! When she showed us the fruit and let us taste it, we were very surprised. The fruit was flavoured between a rockmelon and a cucumber with nice firm flesh. Several of us took cuttings for our own gardens. Next month, we will be doing some fermenting at Fiona’s place. We will be shown how to make Elderflower wine, how to make cider from apples and also how to bottle it. Our Christmas Shin-dig at David’s and Malle’s beautiful home. On Saturday December 20th, we met up at David’s and Malle’s home in Oakdale. It was an excellent turnout, with lots of people bring wonderful festive dishes for everyone to share. 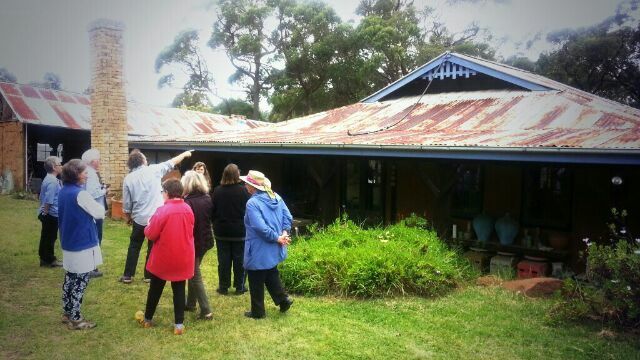 David and Malle are very proud of their home and the heritage of the land that they now mange. 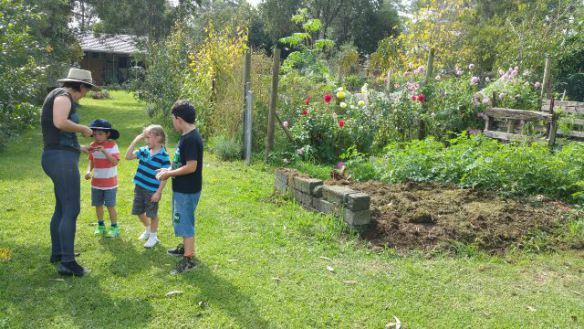 It used to be an apple orchard, but now they have their own private orchard (where wallabies frequently prune things … very frustrating), a veggie patch that Costa would be proud of, immaculate gardens and they have planted out countless numbers of natives to regenerate the area. Lunch was excellent. Lots of wonderful homemade goodies and a few bought one’s too. 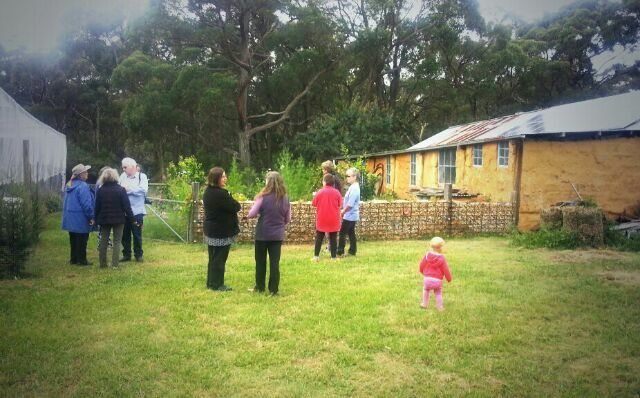 David and Malle invited us all to walk off our lunch around their property. We checked out their orchard, garden patch, dams (fish feeding also) and lots of natives that they planted around their home. It was beautiful. 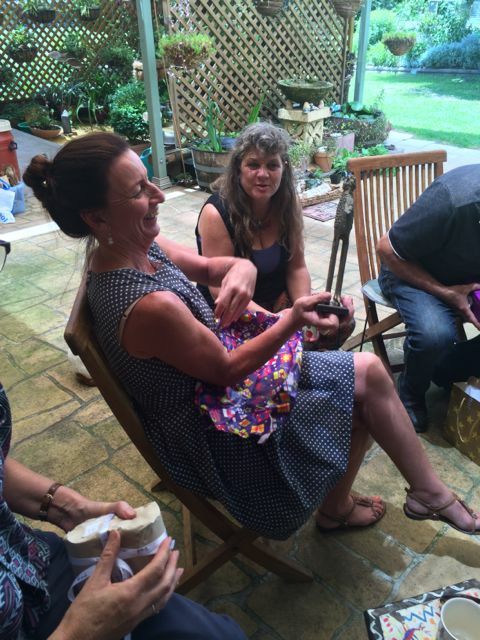 Over afternoon tea, we shared out our Kris Kringle presents. Welcome members … new and old. 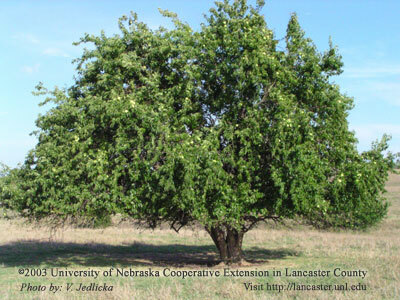 Hello and welcome to the Macarthur Seedsavers website. We have relocated our site to allow us to centrally manage our distribution lists, news, events and other activities that we are affiliated with or just simply enjoy! 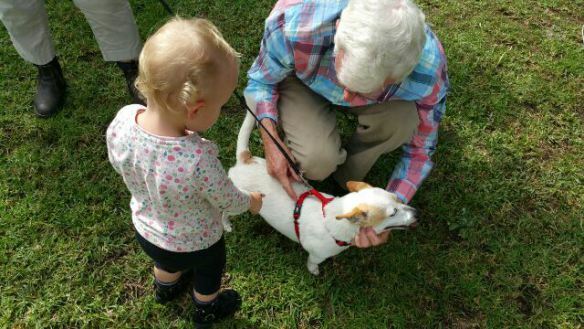 We meet every 3rd Saturday of every month at 10am at a location in the Macarthur district or its surrounds. When we meet up, it can be for a chat, a workshop, special occasion (such as Christmas) or even to plan future events. Whenever we meet, everyone brings a plate of food to share along with any spare plants or seeds that you are happy to swap or distribute. Please feel free to join our group by enrolling to our distribution list. Simply fill in your details on our About page.